Several of you Escapees have asked for a floor plan of Escape Velocity. You ask, you receive. David, I had the same problem until I clicked “Floorplan….” header on the post and just like magic it appeared. Love seeing the plan. I assume her bow is at the top of the plan, right? And the back porch is on the stern end. 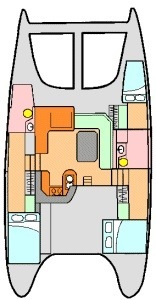 (excuse my syntax) Is the Master Bed Room the one all by itself in the forward compartment.? AND what bunk does Issy claim. So, room for company! Is is 1 1/2 bath? I think I see 1 shower but 2 heads. And, even a little guest bed in the bow. Very nice! Two full baths, Anita. Guest shower is a little smaller than the master but works fine.